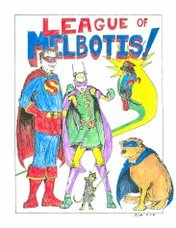 League of Melbotis: Investing for the Future? Here's an interesting column from Newsarama. It seems that as stocks are plunging, somebody is investing in back-issues of comics. Here's the sort-of interesting thing about Back-Issues. Theoretically, there's a limited and dwindling supply. There are only so many copies left in existence of, say, "Jimmy Olsen #134". Unless someone finds a comic miser with an endless warehouse where he's keeping literally hundreds (maybe thousands) of copies of the comic, the rarity of the comic is part of the price point. You cannot grow or mine more Jimmy Olsen #134. You cannot manufacture more Jimmy Olsen #134. One thing that can decrease is the number of people who want a copy of Jimmy Olsen #134. In theory, then, Silver Age comics, in particular, hold value pretty well despite tumultuous economic times, and are much more likely to go up than down in value. What we know now, versus what we thought in the mid-90's, is that not every issue is a collector's item. No matter what sort of holographic cover, or trading card is stapled inside, a bagged and boarded comic is only a bagged and boarded comic of, at best, dubious value. Only time will decide what is a collector's item. Anyway, its interesting to hear investors are making a run on Silver Age comics. I don't have much in the way of a Silver Age collection as its very cost-prohibitive, but compared to a single share of, say, Initech, it's not that bad. It's just not going to make you a profit so much as be a fairly safe place to put your money for a while. Off the market, the comics will probably retain value (especially Silver Age, which is a very different market than modern or Bronze). Like anything else, however, if the investors re-flood the market... it's going to drive costs down. Which is nice for the collector, but for the dealer, its not going to be great. That's not to say that those misers aren't out there with warehouses full of comics. They darn well may be. You hear a lot about estate sales where comics come up, and it can be anything from a shoebox full of moldy Archies to a storage space full of Silver Age classics. And, I hate to say it, but as collectors die, need a cash influx, etc... those collections will continue to rotate to some degree. I don't lose a lot of sleep over it, but I do worry that if I croak tomorrow, Jamie and my parents are going to just drop off my whole collection in a dumpster behind Target. At minimum, I'd hope they would drop everything off at Austin Books so SOMEBODY could make a profit off the collection (note to Austin Books... that's a respectable run on New Gods and Mister Miracle... throw them a few bucks in the case of my untimely demise, okay?). Unlike stocks, T-bills and pork bellies, there's not too much of a regulatory commission for the value of comics. So its something of a pure economic model. Find the price point of a back-issue by whether or not you can actually sell it to somebody (anybody) at that cost. Supply and demand in its simplest form. And maybe that's why so much of the back-issue market has gone to eBay, where you can see the transaction in real time. Kind of fascinating. But, as a total pain for the retailer, its done on a literally comic-by-comic, or run-by-run basis. And that's a lot of work to manage. Thus the built in S&H fee on so many comics. *The comic is no longer worth that amount, but hit that selling point about seven years ago. It seems to me that some comics may hold more value than, say, baseball cards of current or recent stars. Their careers may fade, but popular comics have fans everywhere. I was just going through some old baseball cards of mine from my parents' house. I collected pretty heavily from 1986-1992. I have rookie cards for Mark McGwire, Jose Canseco, and others. Which I should have sold years ago, when they were worth more, and before the players turned out to be such chumps. *expletive* on them. Sadly, the card market went even more haywire than the back-issue market. And, yeah, finding/ buying/ selling is often a matter of timing. I delayed buying a copy of DC Comics Presents by a few weeks from my LCS in Tempe because I thought $15 was pretty steep. It then shot up in value when the character of Superboy Prime was reintroduced and that issue was his first appearance. And, someone else beat me to the shop and bought the issue, which I've never been able to track down again. Hang onto those steroid cards. Those guys will be remembered for their infamy in the future more than World Series winners. My six part "Longshot" series shall pay for my retirement. Who knows? He might get really lucky. He might. That's one of the funny things about hanging onto comics. Every once in a while I look up at a wall of "premium" comics and say "oh, hey, I've got that. $25? Huh." Especially if Marvel suddenly decides to make a Longshot movie or TV show. Weirder things have happened. I know Michael, and (a) he didn't go back and buy these comics. He bought them off the rack as they came out, and (b) he will sell those comics shortly after he's dead anyway. See, "lucky", that was a Longshot joke, and... actually, you were probably just ignoring that. Good move. Oh, jeez... I cannot believe I missed that. I blame the stain fumes. The only comics I have that seems to be remotely of collectible value is the complete collection of Neil Gaiman's Sandman, 1st prints of each (#1-75). The first issue is also signed by Neil Gaiman at his first appearance at DalCon. Interesting thoughts. Though anyone who thinks that they should use their cash to invest in comics instead of just hoarding it onto an interest bearing savings account is nuts. The appreciation on back issues just doesn't rise exponentially enough. My guess is that these may be people who are unaware of the slow rate of return on comics. It may ALSO be people in an irrational panic trying to "diversify".